Talkathon campaign: $5,000,000 well spent? Somebody explain this to me: the i'm Initiative raised about US$1.5 million since its launch sixteen months ago. The i'm Talkathon currently promoting it (for just 30 days) costs Microsoft nearly US$5 million in online ads on Facebook, Pandora, PerezHilton, etc. And that pricetag excludes McCann Worldgroup's invoice. I'm a big fan of the i'm Initiative -of course I am- and it deserves all the attention it can get. But burning three times the proceeds of a charity campaign to promoting it doesn't make much sense in my book. Then again, I didn't major in marketing. In the same article where I found out about the astronomical budget, a Microsoft account director at McCann said that they do not want to jeopardize the wonderful i'm Initiative and that "it's very important [to] not come across as fake.". I thought I was critical of the campaign when I mentioned it last week, but a substantial percentage of pre-censored comments on the Talkathon blog are referring to the fake character. And then there are amusing/provoking blog posts like this and this. >> Feel free to leave your comment in our forum. Since last week there's a new Messenger game called Wimblepong available to users from several European countries. To be honest, it isn't really new but rather a recycled version of last year's Live Pong. But with the ongoing British Open and the fact that you can (quite easily) win Microsoft webcams and headsets until July 22nd, it's definitely worth mentioning. I did have some trouble playing it as my voice would control the opponent's paddle instead of mine, but that seems to be a one off bug. >> Play Wimblepong in English/Dutch/German/French via our Messenger Games Launcher. >> Bonus: An animated Wimblepong Display Picture for Windows Live Messenger 9.0 users. INSPI(RED) is a group of three mountaineers who attempted to reach the summit of Mt. Everest in hopes of building awareness about (PRODUCT)RED —a business model designed to raise money for The Global Fund to fight AIDS in Africa. You can find out if the expedition was succesful on the team's blog. They've also put together a free Windows Live Messenger theme pack for us users to help spread the word. 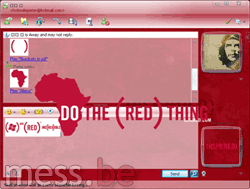 It includes one display picture, three conversation backgrounds, three custom emoticons and 3 winks, all (RED)-branded. >> Download the (PRODUCT)RED Theme Pack. >> More information about (RED) products here. First, it is supported by selected carriers only. To find out if you're lucky, go here and try the download. Subsequently, Windows Live Hotmail accounts must be revalidated every 90 days to continue receiving email messages to the BlackBerry smartphone, as required by Windows Live Hotmail for security purposes. Of course you'll receive a reminder prior to the end of the 90-day window, but it seems redundant. - Support for personal status messages (finally!). - Improved and more MSN Emoticons. - Improved error handling for networking issues. - Improved http method support. - Several random bug-fixes (networking, contactlist handling). - iPhone 2.0-style filtering search in standard contact list. - Fixed ignorance of email address field when looking up names in address book for MSN/Windows Live Messenger and Google Talk contacts. - Integration of Facebook chat. - Major performance improvements, 150 enhancements and bug improvements. See here for a complete list of changes. You can download the current beta (1.3b5 at the time of writing) here or by enabling "Update to beta versions when available” in the Adium General preferences. Creative mp3 player fansite epiZENter has obtained photos and some details on the upcoming ZEN X-Fi multimedia player. Of course it plays most audio -and videofiles, but what attracted my attention was the addition of Windows Live Messenger (and Yahoo! Messenger), accessible via the built-in WiFi. So where's the keyboard on this thing, the chat-aholic in all of us wonders. Well, the nine buttons in the middle suggest mobile phone-like (predictive) text input. But considering the built-in speaker and microphone, I assume Voice Clips will be an even more convenient way to communicatie with Messenger contacts. >> More info on the Creative Zen X-Fi at epiZENter. >> Check out eBay for Creative media players . Last week Microsoft released a minor update to its Messenger client for Mac. According to the software's homepage, version 7.0.1 improves support for users of the VoiceOver feature in Mac OS X and it fixes user interface issues that appear when Messenger is used with some European languages. >> Download Microsoft Messenger for Mac 7.0.1 (available in 11 languages). Get ready for an image heavy post that preps you up for tonight's Euro 2008 final. After the game, I'll update this post with the animated display pictures of the (hopefully plenty) goals! Just one goal but an impressive one... See below. >> Animated Display Picture of the final goal of Euro 2008: Germany - Spain : 0-1 (Torres). >> Animated Display Picture: Spain wins Euro 2008. >> Download Spanish Messenger Emoticons. >> Set your favorite Euro 2008 goal as animated display picture in Windows Live Messenger 9.0.